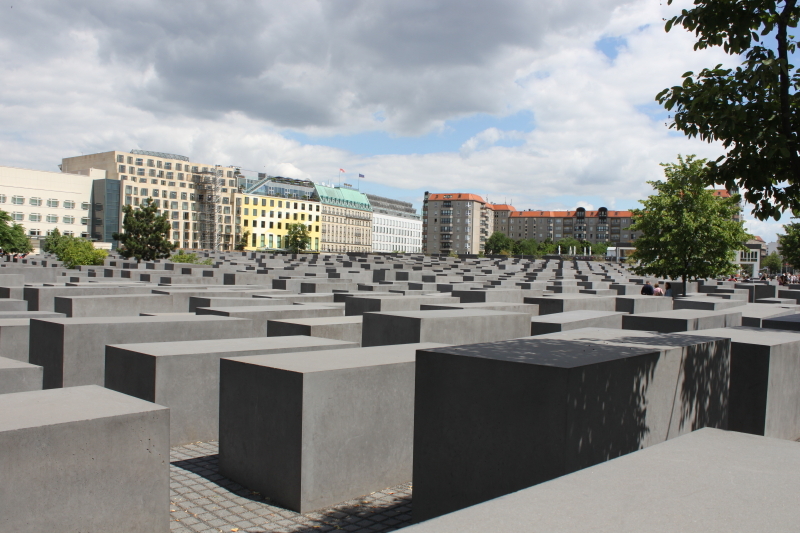 The Berlin Holocaust Memorial is a series of 2,711 gray monoliths, which all together take up an entire block near the center of the city. On the outskirts of the Memorial, each monolith is about waist high. As you walk toward the center, they get taller, and the ground begins to dip lower, as if the entire thing is built on the inside of a giant, shallow bowl. By the time you reach the middle, you’re lost in a forest of stone slabs, unable to see anything but slate gray and, if you look high enough, the sky above. There are no words on the Memorial, so at first glance, you might wonder at its purpose. It seems an odd thing for a series of unmarked gray stones to take up such a large swath of land in one of Europe’s most bustling cities. But if you look closer, you see that not all the slabs are the same. Some are crooked, leaning slightly in one direction or the other, and the top surfaces aren’t entirely flat. If you look across the top of the memorial, at the undulating field of stones, your mind wants to find a pattern, but it can’t. Is it just a group of stone blocks, slowly rising in the center, or is something deeper going on? I’m an idealist when it comes to storytelling. I believe strongly in the power of stories to promote empathy among human beings: when a person shares his story with another, those two people can then relate in a way they couldn’t before. I believe that storytelling, whether through writing, or film, or some other medium, is the greatest unifying force in the world, and maybe, if enough people of different backgrounds are able to tell their stories to each other, maybe there really will come a day when things like wars can be relegated to the history books. Good stories can bridge individuals, and cultures, and countries… stories remind us that people who are different from us are still people, with hopes and dreams and families and friends of their own, and that those people aren’t just abstractions, they aren’t just stereotypes, they’re full-fledged human beings. I think this is true for both fiction and nonfiction; any story where you have to relate to characters different from you, where you have to put yourself in the shoes of someone else, whether that “someone else” is real or not, helps us learn to empathize. 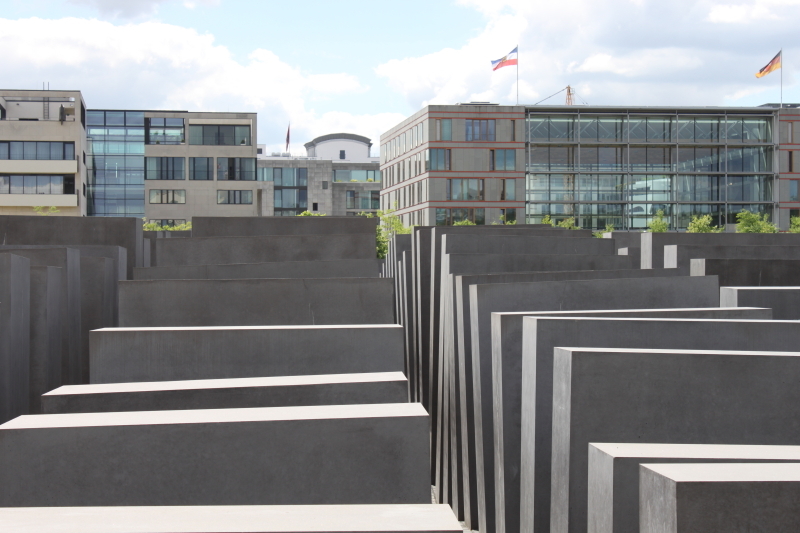 But in Berlin, the strange gray stones stand as a stark, disturbing reminder that stories can be twisted. In the 1930s, Adolf Hitler and the Nazis weaved a story of their own. But it didn’t break down stereotypes, it reinforced them. It was a story which denigrated and demonized an entire group of people, taught that those people were not worthy of empathy, respect, or even the slightest shred of human decency– it taught that they were vermin, or lower than vermin. Mired in problems, economic and otherwise, the German people were looking for someone to blame for their plight, and the Nazis told a story that gave the Germans the villain they had been looking for: the Jews. A story like that has many things in common with the Holocaust Memorial in Berlin. It’s not something that hits you all at once. But if it’s told enough, over and over again, it builds into something sinister, and slowly it skews your perspective. The facts and details don’t line up, but you may not even notice, so lost are you in the greater overall mass of the structure. And then, like the Germans of the late thirties, you get totally surrounded by the field of oppressive monoliths, losing sight of the real world for this alternate world of inescapable wrongness, looming over and consuming you. You completely lost sight of the real world, when all you thought you were doing was exploring a field of simple gray stones. Even if you do manage to stay outside of the slabs, they still warp the landscape, corrupt the horizon. Whether you’re standing on the edge of the thing or right smack dab in the middle, they will affect your worldview, and not for the better. The Memorial is a wordless reminder that words have power, and like any great power they can be misused, sometimes to horrible, horrible effect. I’m still an idealist. But as I leave the Memorial behind, heading back toward the Brandenburg Gate, I can’t help but feel chilled by the very real power of storytelling’s dark side. I’ll be back-dating these entries to the day they happened. There probably won’t be a blog entry for each day, just whenever one pops into my head and I finally get a chance to write it. By my count, this flight was my seventh round trip over an ocean since 2000, so they’re kind of becoming old hat. But I haven’t gotten any better at sleeping through them, which is disappointing. Heck, for this trip, I even bought one of those pillows that are shaped like a horseshoe and wrap around your neck. Dang– I thought for sure that would do the trick. 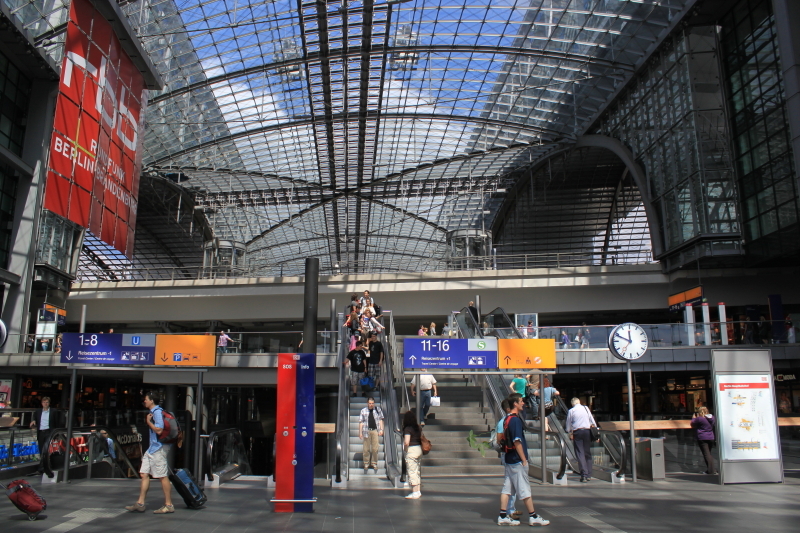 So we landed at the airport at about 9:30, and I got to the train station shortly after 11 (getting there was WAY more of a chore than it should be, thanks to the otherwise-efficient Berlin public transport system.) I’m meeting a couple of friends, Mark and Roberta, in a little town called Quedlinburg this evening, but Quedlinburg is only a three-hour train ride away– which means I’ve got time to kill. So I stash my luggage in a locker to go for a walk around Berlin. I love walking around the city– I got to do in 2008, and I loved how green and modern the city feels, while at the same time retaining a lot of character in buildings like The Reichstag and Brandenburg Gate. The day is beautiful, sunny but not too hot, and despite operating on no sleep and almost no caffeine, I’m feeling no sign of jet lag as I walk. So far so good.